Our home and guest house features three private, modern, and tastefully appointed guest rooms - each named after our favorite Oregon AVAs: Dundee Hills, Eola-Amity, and Yamhill-Carlton. Our guest rooms are all located on the main floor of our home with access to a deck overlooking the vineyard and stunning views of the Willamette Valley and the Cascade mountain range. Each room features a private ensuite bathroom with locally crafted spa products, a bedroom with a comfortable queen size bed, satellite TV, high-speed internet, and a semi-private deck sitting area - perfect for enjoying a bottle of wine. Our Dundee Hills suite is the largest room and features a larger custom shower and a comfortable sitting area perfect for two. The Dundee Hills suite is located at the west end of our guest wing, nearest to the great room. Our Yamhill Carlton suite is located in the center of the guest wing and features a generous custom shower and a reading chair for one. Our Eola-Amity suite features a large custom shower room with a free standing soaking tub and a comfortable sitting area for two. The Eola-Amity suite is located on the east end of our guest wing, nearest to the breakfast deck. All of our guest rooms have a modern-rustic design aesthetic with a nod to the local wine industry. If you’d prefer a more private stay, we can offer the Vintner’s Studio. The Vintner’s Studio was originally built as our design and wine studio, and is now available to book for up to four people. 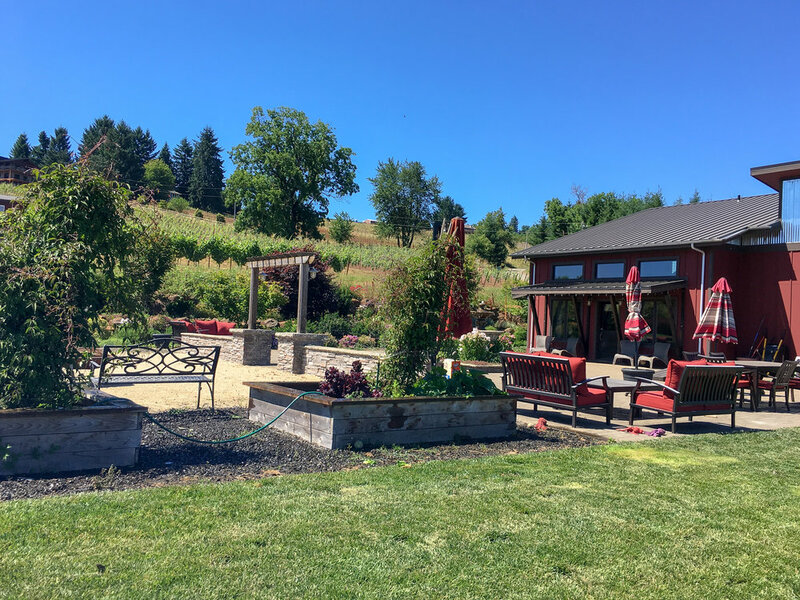 With a private fenced patio garden and lawn, Vintner’s Studio is a perfect kid friendly, family retreat in Willamette Valley. Although we do not offer a breakfast service, the studio is outfitted with a vacation kitchen and an expansive, private outdoor dining space. A daily delivered basket of baked goods, yogurt and fruit for may be purchased in advance. Vintner’s studio may be rented for $275 per night (2 night minimum) plus a 1.8% tourism tax. We have multiple areas for guests to relax in and enjoy during their stay. Our Great Room, is tastefully appointed with armchairs and relaxing sofas overlooking the spectacular Willamette Valley. With a fireplace and a beautiful sitting area, it’s a wonderful place to sit and have a glass of wine. Our Breakfast Lounge is where you’re going to start your day with us. Located at the east end of the guest wing, we have a beautiful kitchen and dining area with scenic views of the valley, including a full deck with another exterior dining area. Enjoy a freshly cooked breakfast with a cup of coffee while you take in the incredible views - particularly, stunning sunrise views of the Cascade mountain range. On a clear day, you just might spot Mt. Hood. Our Guest Lounge is a smaller room off of the Great Room, and features a wet bar and dining table, outfitted with coffee, tea, and snacks for an afternoon snack. The long table is the perfect place to catch up after a day tasting wine in the valley, and two red arm chairs are placed by the fire. Through the french doors, you’ll find a spacious, private deck area to watch the sun set over the valley.